The embassy of the Sultanate of Oman in ROK launched its yearly program “Welcome to Oman”. H.E Mohamed Alharthy, Oman ambassador said: “This year program will focus on Public Diplomacy [JB emphasis] through a series of cultural and Artistic activities including lectures series at the embassy and Korean school and universities, exhibitions, performances, promotional programs on tourism and investment opportunities which purpose is to promote understanding and bring nations together and closer which aims to enhance the relation and cooperation between Oman and Korea”. Image from article, with caption: H.E. Mohamed Alharthy, dean of the Seoul Diplomatic Corps. presenting about Oman. At the launching program the embassy hosted 26 Koreans students from Hankuk university, Myeongi, Dankook, Chosun and Busan university of Foreign studies. 20 students among them are going to Oman to study Arabic language at Sultan Qaboos College for teaching Arabic to Non-native speakers. Two professors from Hankuk university where among the attendance. 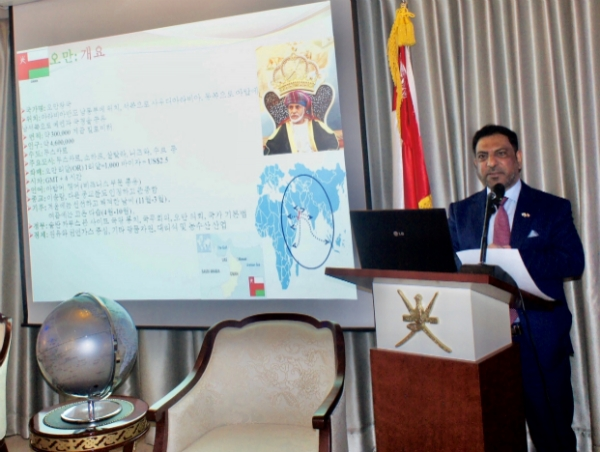 H.E Mohamed Alharthy welcome the attendance and delivered a lecture about Oman which highlighted the historical and cultural aspects of Oman and Oman-Korea relation and cooperation. He also emphasized the Oman experience in understanding, tolerance and coexistence among society and religion to promote value of coexistence, dialogue and peace. He also gave presentation about Sultan Qaboos College for teaching Arabic to Non-native speakers which program not only teaching the language but culture as well and allows participants to share their language and culture through a series of cultural, artistic, and sport activities. The participants toured the embassy exhibition which shows cases the cultural aspects of Oman including Arabic calligraphy and history and rich heritage of Oman. They also enjoyed the beautiful architecture of the embassy which is depicted from the Omani, Arabic and Islamic civilization. The participants had the chance to experience the Omani – Arabic hospitality.